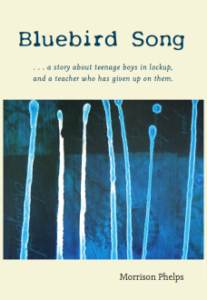 6 by Morrison Phelps – A story about teenage boys in lockup, and a teacher to has given up on them. A rare glimpse into the lives of young felons and the adults who supervise them told from “inside the fence,” marked by dark drama, mystery, mounting tension and humor that ranges from subtle to ribald. Bluebird Song is a story for adults who care about youth issues, and have the courage to read about teenagers in lockup. Based on many years of teaching incarcerated teenagers, author Morrison Phelps presents a rare glimpse into the lives of young felons and the adults who supervise them. Told from “inside the fence,” Bluebird Song centers on five unforgettable characters whose interaction is marked by dark drama, mystery, mounting tension and humor that ranges from subtle to ribald. These story elements culminate in a fateful coup de grâce that will leave some readers with a sense of sadness and resignation, while others will find hope and inspiration. The setting is the Pacific Northwest where Cedar Grove Correctional Facility for Boys (not an actual place) operates a school for the inmates. Among the faculty there’s a veteran teacher who long ago was a young idealist. But now burned-out and disaffected he’s given up on “these dead-end kids.” Surprisingly, he experiences a change of attitude with the arrival of a new boy who seems to have a mysterious purpose for being among the others. Artfully crafted, Bluebird Song is both heartwarming and tragic as it captures the energy, humor, thoughts, edgy behavior and expressions of incarcerated youth. Themes include: coming of age, betrayal, crisis of faith and a perspective on near-death experiences that offers a contrast to current pop culture books about the hereafter. A captivated look into the lives of so-called “bad boyz” as they do their time. Order Bluebird Song from your favorite bookstore or Amazon.com.